By Martin Simons, reproduced by courtesy of Australian Gliding, February 1975. 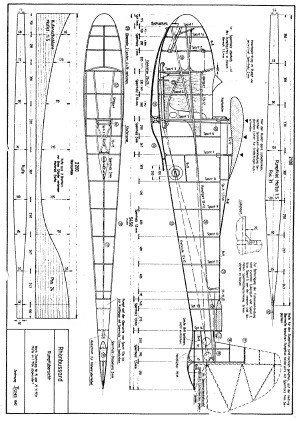 Hans Jacobs’ 17.4m design, the Rhönadler, was a great success as the first factory production sailplane, but it dated rapidly wit its thick, strongly cambered wing, and it was not cheap, either. 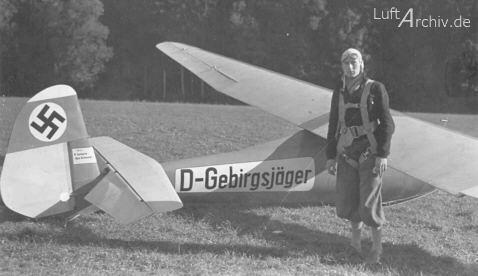 Gliding clubs felt also that there was too great a gap between the Grunau Baby, on which soaring flights up to Silver C were commonly made, and the big “Adler”. In 1933 therefore, one year later than the Rhönadler, Jacobs designed for Alexander Schleicher the Rhönbussard. With a span about a metre more than the Baby, and the same wing section, it would be a natural step up for the club pilot, and its streamlined fuselage, higher aspect ratio and cantilever structure would ensure a better performance. The wing loading was higher than that of the Rhönadler, which was expected to give it a better cross-country performance, although the bigger aircraft would do better in weak thermals. 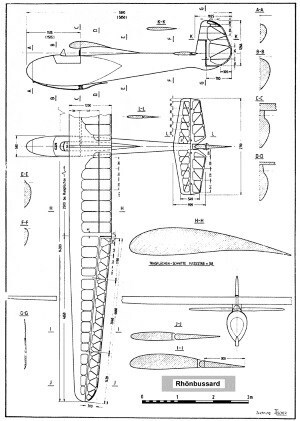 The basic structure of sailplanes had by this time become almost standardised, following the same general pattern as the Vampyr of 1921. The wing was in two parts with a strong main spar, pine for the flanges and plywood for the web. Light built-up ribs were glued to the spar in front and behind, with plywood covering the entire leading edge to take twisting stresses and preserve the airfoil contour, while fabric was adequate behind the spar. A light secondary spar carried the ailerons, which on the Bussard were more than half the span in length and diagonally braced. The wing planform was simple; a rectangular centre section with tapered outer panels and rounded tips. There was no dihedral. Jacobs avoided the constructional difficulties of the fashionable cranked or gull wing. The fuselage was dumpy and short, with ample room for the pilot in the fat, bulbous nose. The wing, which in rigging was joined together into one piece first before being mounted onto the fuselage, sat on a short neck or pylon. To keep the centre of gravity in the right place with such a short moment arm, the cockpit had to be well back, so the pilot’s head emerged underneath the leading edge. He had no upward view at all. Aft of the wing the streamlined plywood tube, stiffened as usual with internal cross frames and longerons, carried a tailplane of generous area with elevators, instead of the more usual all-moving “pendulum” surface. This was intended as a concession to stability in an aircraft that in fact was expected to be sensitive and highly manoeuvrable. The rudder, with very small fin, was aerodynamically balanced in the orthodox fashion of the time. The prototype appeared at the 1933 Rhön competitions, and although it made no great flights against such expensive machines as Hirth’s 20 metres Moazagötl and the super-lightweight 12 metre Windspiel, it attracted favourable attention from the less expert pilots. Orders were placed, and the production line was established. Already, however, there were pointers to the future. At this competition with more than forty sailplanes flying above the Wasserkuppe there were two mid-air collisions and one near miss, which resulted in an accident. Alexander Schleicher himself was involved in the latter accident. He stalled and damaged his glider (not the Bussard) in seeking to avoid another glider above the slope. For the first time people began to think of the pilot’s need to see where he was going. At the next Rhön meeting in 1934 sixteen Bussards outnumbered every other type except the Grunau Baby, of which there were 33. However, by the following year the atmosphere of the contests had changed. Clubs now were restricted to a few entries each. 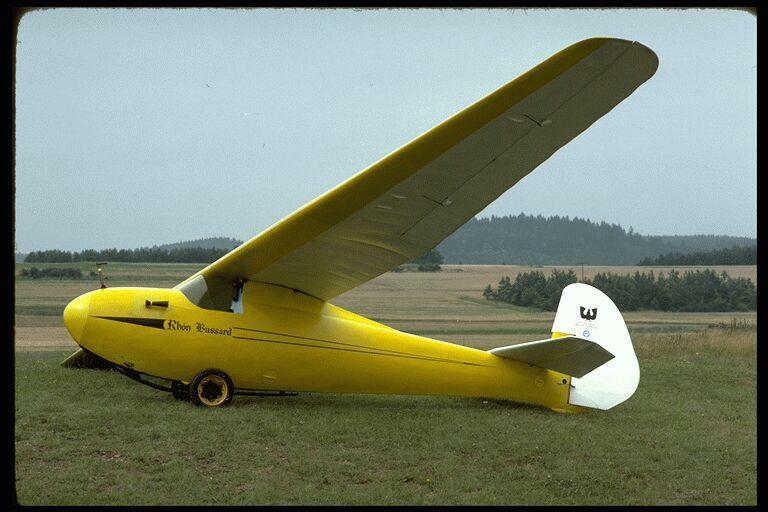 A hundred gliders at the Wasserkuppe, as there had been in 1934, were too many. The result, naturally enough, was that henceforth, only the better pilots and the better sailplanes of each group were entered. The Grunau Babies disappeared altogether, and the number of Bussards in the competition was almost halved. By 1936 only five were entered. These figures, however, obscure the Bussard’s popularity with clubs. 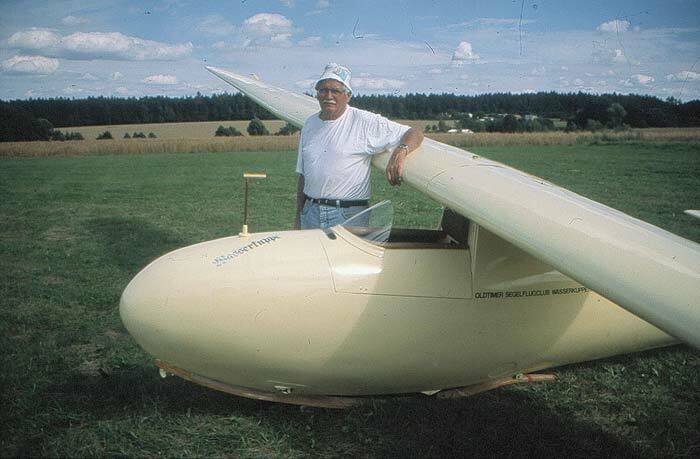 It was not intended as a top competition sailplane, or as a record breaker. It was relatively cheap, very responsive to the controls, and aerobatic. 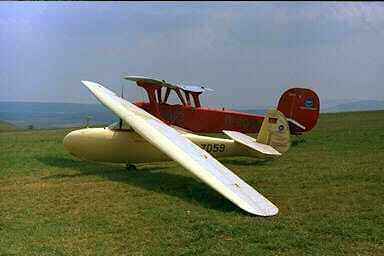 It was also capable of very good performance once the pilot had learned how to fly it well. After the rather sluggish Grunau Baby, the Bussard called for a lighter touch and constant attention, but it had no serious vices, the wingtips were well clear of the ground for take-off and landing, and it was a quite strong, good, all-round club sailplane. There was one world record broken by a Bussard, though it could not be recognised. On 23rd June 1936 Hermann Seele took an aerotow from his home base at Hirzenheim, and released under a growing cumulus which did not seem excessively large. He quickly reached cloudbase at 1400 metres, and since he had some blind flying experience in powered aircraft he continued the climb inside, the variometer showing 4 metres per second. He soon went off the scale. The altimeter needle rotated like the second hand of a watch, and soon recorded 3200 metres, which was its limit. Seele judged his height thereafter by the barograph needle, which was visible to him. The trace was visibly extending upwards and soon it was over 5000 metres, easily a world record. Seele was now bitterly cold and suffering from lack of oxygen, his hands were so chilled that they had no feeling and he could barely move the stick. Suddenly he struck violent turbulence and although he endeavoured to straighten up and leave the cloud, the Bussard was thrown about so violently that he quickly lost control and the airspeed began to build up. It began to hail abruptly and the flimsy celluloid screen bent, collapsed, and was ripped off by the combined forces of air and hail. The stones pummeled the pilot until he could hardly see, and was speedily coated with ice on the face and chest. His harness had worked loose, and he was bounced about in the cockpit. Suddenly with a loud noise the left wing broke off and vanished into the mist. Seele’s hands were too cold to undo the belt buckle, but he managed to wrench himself partly out of the harness, and another violent blow threw him partly out of the cockpit, so he found himself hanging by his right arm, still tangled in the straps, but outside the fuselage. The right wing broke off. Even at this stage, Seele struggled desperately to reach back into the cockpit for the precious barograph, but failed to grab it, and suddenly his arm slipped free and he was clear. He pulled the ripcord and at last all was calm again as he swung beneath his parachute. A wing floated up out of the murk, but missed him and was lost again. The hail turned to snow, then to rain, and he emerged from the base of the cloud, his arm aching and his eyes so battered that he could barely make out the ground below. He landed with a thump in a tree, and was rescued some time later by the local peasantry, and rushed to hospital. The barograph was never found. The wreckage of the Bussard was scattered widely. That the Bussard was also capable of good distance flights was proved many times. Probably the best ever achievement was a flight of 470km from the Wasserkuppe to Stargard in Pomerania, with a climb to 4300 metres on the way, by Luftwaffe Lt. Paselak in 1939. Rhönbussards were exported to several European countries, three to England and at least one to Argentina. The Argentine Bussard made many remarkable flights, including one across the desolate River Plate Delta into Uruguay in 1944. The first Bussard to arrive in England was aerotowed there in stages in 1934, and toured the country with Cobbam’s Flying Circus. The pilot at these displays was Joan Meakin (later Mrs. Joan Price living in the Isle of Wight). Her routine included multiple loops, chandelles and stall turns, followed each time by a meticulous spot landing. After some time there were signs of strain in the main root fittings and these were strengthened. Joan had strict instructions to do no soaring, since this would disrupt the show timetable, but she ignored this sometimes, and at one display, after soaring for a while, she was called down by aeroplane and then instructed to go off again and attempt a distance flight. This she did and so became the first Englishwoman to make a cross-country flight in a glider. This Bussard, and another, still survive in England in excellent flying condition.